Mariah Carey struggled to belt ‘All I Want For Christmas Is You’ live on Christmas in Rockefeller Center on Wednesday, December 3, 2014. Despite the struggle and vocal cords malfunction, I appreciate that she performed everyone’s favorite song live. In my opinion, she should have her vocal nodes finally removed if she wants to continue singing. But still, Mariah is Mariah Carey! Carey treated us to a live version of the song during the ‘Christmas in Rockefeller’ television special aired Dec. 3 where they show the lighting of the iconic New York City Rockefeller Center Christmas tree. 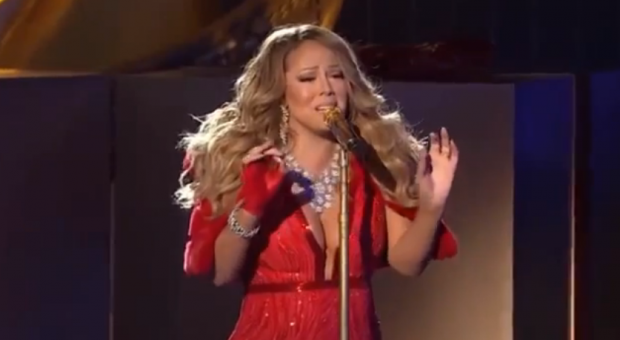 Dressed in a glittery, long red gown, Mariah was gorgeous singing the Christmas track with a group of young dancers accompanied her in the background, dressed in all-white outfits like snowflakes.